Welcome, great to have you! 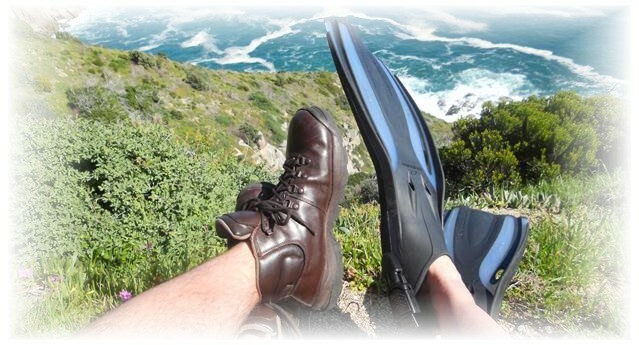 Boots and Fins is mostly about two of the funnest things you can do Where The Mountains Meet The Sea (known to cartographers as the Western Cape, South Africa). If you want to breathe some mountain air, the possibilities are endless as there are so many options along well-maintained paths all over. From a short stroll in your work shoes to a multi-day excursion as tough as you want to make it. Then dive into our oceans – we have two to choose from. Scuba diving is amazing. It’s a different world in all senses of the word. Those who do it invariably become passionate about it. On this blog you will also come across a few of my other favourite pastimes, like open water swimming and – for those times when the weather’s bad – reading. Hello B&F cool blog, I stumbled on while looking for info on the Giants Hut fire. Thought you might like to see these http://www.flickr.com/photos/flashbac/ I worked on a project recently, photographing the help lift of materials to the hut. There is also a facebook page about the rebuild – think it is the builders page. Take a look. Your blog is really informative, I will browse the other hikes when I have time. Regards Peter Upfold. Hi Peter. Thanks for the comments. Your photos are stunning! Loved the Giants Hut photos especially. We spent many happy holidays in the ‘Berg before we moved to the Cape. Nice to see the hut being restored, to me it’s the ‘quintessential’ Berg hut.